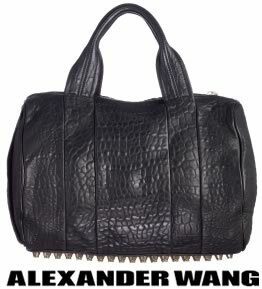 Everyone remembers my Alexander Wang Rocco love and letdown story. My returning this bag still haunts me a bit, as I rarely *rarely* return bags and this one held such a special place in my heart but fell short when it came to my expectations. Either way I will not ignore this bag or stop showing support for a design and idea that I love. One simple word: unimpressed. Chloe Dao was Project Runway Season 2‘s winner. While on the show her designs were elegant and fit in all the right places for the women that modeled them. Granted The Chloe Bag by Chloe Dao is meant to be used as an overnight bag or carry on, the color and saying looks overly simple and grade-schoolish. 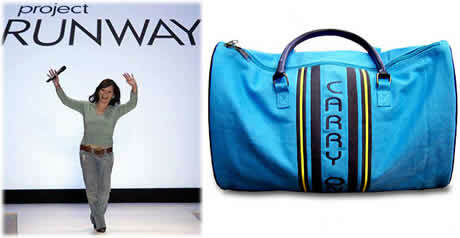 The phrase “Carry On” is stitched on the blue canvas bag which was inspired by one of Tim Gunn’s popular sayings from the show. Measurements are 17″ wide, 10″ height, 7″ diameter, yet either way I would expect more from Chloe. Via NBC Universal Store for $95. I wish you all a wonderful Sunday, may it be relaxing and joyful! As for me, I will probably spend it working or exercising, my life is that exciting. Also, I’m feeling very down-to-earth today, I crave the fresh air and maybe a bike ride in the woods later, if the weather turns out nice. Reason to feature a bag that reflects my mood, too. Not so much the bag itself, but its material. 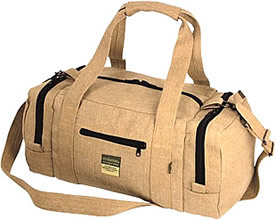 The Hemp Duffle Bag is made of Romania hemp by a company called Ecolution. Before some of you may run off scared and calling me a hippy, let’s get some facts straight. Hemp is extraordinariy durable and provides a very sustainable material for all sorts of clothing and bags. It gets softer through use while still retaining its natural strength. Hemp is an eco-friendly alternative to both cotton and wood fiber, it is grown and processed without chemical additives – this is particularly important for people with allergies and chemical sensitivities. It grows very fast without depleting the soil, too. Chemical processing, which pulps the fiber with heavy caustic sodas and acid rinses, strips the fiber of much of its rich character and strength and produces hazardous, environmentally-destructive waste. I’ve had a hemp backpack for years and it still looked like new the day that some jackass stole it from me. This particular duffle bag measures 25″ x 9″ x 9″ inches and goes for a mere $63 through Abundant Earth. Verdict: You ain’t gotta be no hippie to sport this everlasting and versatile bag. P.S. Ecolution carries a wide variety of clothing, shoes and other accessories made from hemp, too. You may wanna check it out. What is up with Jessica Simpson being the handbag guru of all time? Seriously if I owned about 1/546 of what she owns, my life would feel complete. She seems to be a major handbag and purse trend setter. Right when some fashionista realizes that studs are in, they also realize Jessica already is sporting them. To be a minister’s daughter must be nice. So I must say that for the most part (not all the time at all, trust me I’ve seen pics), Jessica is completely style savvy. I just want to rock out looks like she does, like this Lanvin Jet Set Bag. This trendy little number is a duffle style bag with all over nickel studs. 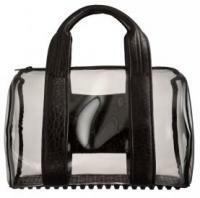 This is the “it” bag of the moment and has also been seen on other A-list celebs like Lindsay Lohan. A little side note, but does anyone else realize that LiLo is always sporting the same bag as Jessica. My question is who gets it first? My guess would be Jessica is the trend setter and Lindsay is the follower. Any takers? Anyhow, Jessica was able to put the stud in this Lanvin bag, and you can too for $1600 @ Barneys.